Horst-Benidorm-Property Research Corp. team member, Gary Aspnes, won the 40+ race at the Keith Berger Memorial Criterium. The race was held in East Hartford, Connecticut on Sunday June 27th. Aspnes was supported by a strong team. Wade Summers joined him in the original 12 man breakaway that was established early in the race. Arlen Zane Wenzel, Ted Donofrio, Wayne Prescott, Ian Sinclair, Thom Reid, and Matt Domnarski rode strong support in the peloton. With about five laps to go in the 25 mile race, Aspnes attacked his 12 man group with Ed Angelli, a Horst-Benidorm-PRC Masters Cycling Team alumnus. The two riders forged an alliance and rode away in the final laps. In the final sprint, Aspnes had too much for Angelli and earned the most significant victory of his career. Horst Engineering has supported amateur cycling since 1997. 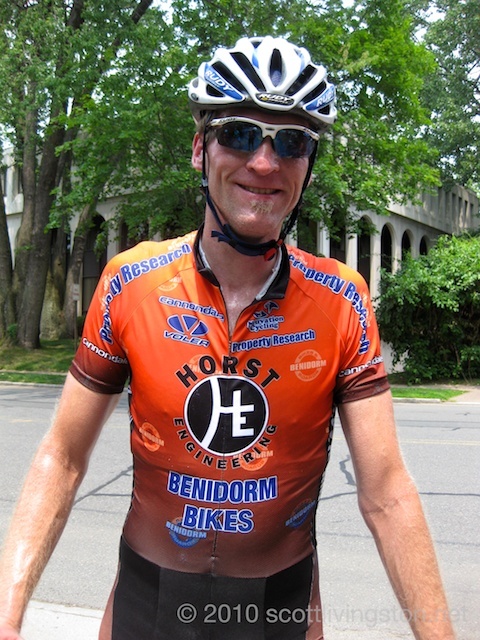 The Horst-Benidorm-Property Research Corp. Masters Cycling Team competes in events (road cycling, mountain biking, cyclocross) all over the Northeastern United States. Additionally, Team Horst Sports competes in endurance sporting events (triathlon, trail running, ultramarathon trail running, road running, adventure racing, and cycling) all over the world.